After beautiful Easter Weekend weather, similar conditions will prevail for at least one more day around southeast Louisiana and southwest Mississippi. The next cold front will arrive Tuesday night. Today and Tonight: Expect a fast warm up into the 70s and 80s on Monday beneath partly sunny skies. 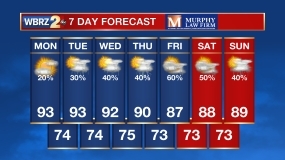 Rain chances cannot be eliminated but look minimal at 10 percent. Overnight lows will be in the mid 60s thanks to southerly winds returning a touch of humidity. Up Next: Tuesday will be setting the stage for an overnight cold front that could produce strong thunderstorms with gusty winds. The National Weather Service Storm Prediction Center has posted a 2 out of 5 “slight risk” for severe weather. The bulk of the rain will arrive after the midnight hours Tuesday night and last through early morning on Wednesday. The front looks to be a quick mover so rain totals will likely be less than one inch. A cold front will clear out the rain and temperatures will drop quickly with cool and quiet weather slated for Wednesday and Thursday. As the pattern speeds up and gets more active, more showers and storms could return as soon as Friday. As southerly flow takes hold of the central Gulf Coast, dew points will begin to climb in advance of the next cold front. 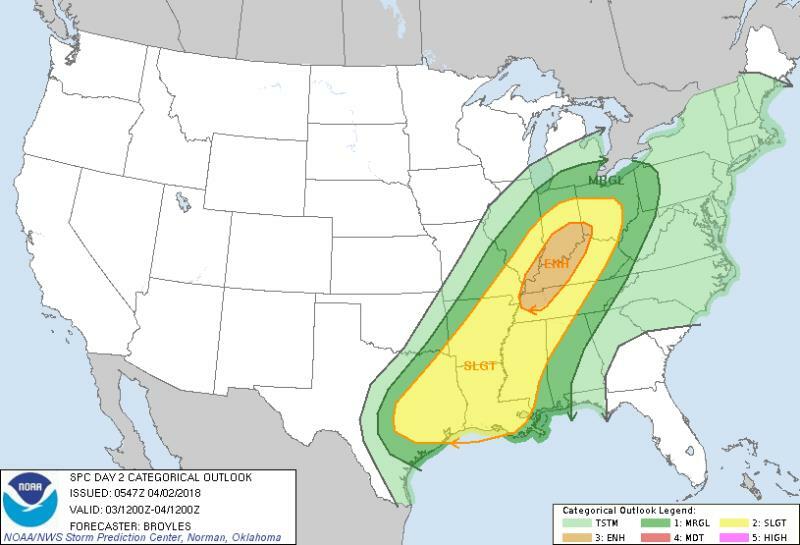 A shortwave trough move across the central United States will guide this boundary into the region and pass a little closer to the forecast area resulting in a “slight risk” for severe weather from the Storm Prediction Center. The main threat along a squall line of showers and thunderstorms will be gusty wind as the front itself will be moving quite fast at 35mph or so. As usual with a nocturnal storm threat, instability may be a limiting factor. Temperatures will cool quickly behind the front and this will be noticed into Wednesday. Another cold front will stall in the Gulf by Friday allowing a focal point for showers and thunderstorms leading into the upcoming weekend.